The eastern shore of Mare Nectaris is seldom imaged, perhaps because it is so dramatically insignificant compared to the opposite side which is studded with the magnificent Theophilus trio and the towering Altai Scarp. Of course, that lack of familiarity makes the eastern shore that much more interesting! Nectaris perhaps has more flooded craters on its margin than any other mare - nearly a dozen are visible in this image. The rims are commonly missing on the mare side, suggesting that the basin center subsided and mare lavas lapped against the seaward crater walls, sometimes overtopping them. 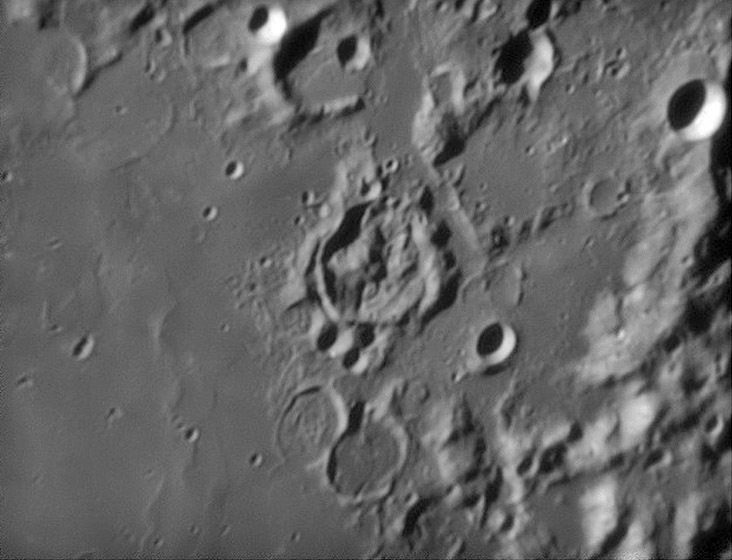 But the focus of this image is the bizarre 33 km wide crater Gaudibert. It is a crater - there is a well-defined rim on the west, but the eastern edge of the crater is bulbously mountainous, and the interior contains two massive mountains. Craters aren’t supposed to look like this. The Lunar Orbiter IV image doesn’t help understand this strange crater, but the high Sun Clementine image shows something completely unexpected - the bottom third of the crater is dark, like maria! But Zac’s image shows that the floor is not smooth like mare lava flows; the dark material is pyroclastics (volcanic ash) probably erupted from the short rille-like features. In fact, Pete Schultz considers Gaudibert to be a floor-fractured crater. In this interpretation the mountainous interior is simply a strongly uplifted floor. Its location near a mare edge and associated pyroclastic volcanism are consistent with ffc, but Gaudibert’s interior mountainness is very much stranger than any other ffc. I am not satisified that I understand this king of weirdness crater. This is a classic LPOD from mosaics, which show that the leftmost mountain on the floor of Gaudibert is crossed by a short segment of a 2 km wide, parallel-sided linear rille. That seems consistent with the idea of uplift for as the mountain was raised it may have expanded laterally, allowing downdropping of a piece of its summit. August 12, 2006. 31 cm Newtonian f/28. SkyNyx 2.1M and Wratten 25A filter. Frames stacked using Registax 4 beta.